This ultra-soft microfiber bedding set includes sheets and features whimsical flowers and fluttering butterflies in an array of multi-colors. The printed fabric comforter and sham reverse to a solid purple. We bought this for our grand-daughter who is 4, she wanted butterfly's on her bedding. She loves it! The pieces are well made, the colors are bright and cheerful. My only complaint is that the sheets are microfiber, I am not a fan. Microfiber does not breath. We found some cotton sheets that work well with the bedding and will save the microfiber sheets for possible emergency bed changes only. For the money it is a good value anyway. This is a very nice set and the price is great. I love the colors and the feel of the comforter and sheets. I purchased this for my 3 year old who loves flowers and Butterflies. She loves her new set. I would recommend this set. Cant beat the qaulity especially for the price. I love Overstock. The comforter is actually quite comfortable however the sheets and pillowcases are paper thin. The pillows will not even stay inside the pillowcases because they are so thin. The items are true to color and for the price they are ok for the time being. I had read all the reviews and took a chance on this bedding set because my toddler loved it. The washing label said to wash on delicate so to be extra careful I put it on extreme delicate for washing and delicate for drying. After removing from the dryer I found that the edge had a 3 inch tear at the inseam. I am very upset but have no recourse as the return policy says it can't be washed or tags removed. I would not recommend this product. I did look at it before washing and didn't see any issues. I have also never had a problem with my washer or dryer damaging items. Apart from damage the comforter is very light weight and not recommended for cold weather. The pattern and matching sheet set is beautiful. I bought it for my daughter for Christmas. I ordered it on December 14th and it was delivered the 18th. I was worried I wouldn't receive it on time, but much to my surprise it made it. It was really soft and in great condition. It got even softer after I washed the set before its first use! This was the perfect set for our daughter's bedroom. Lovely pastel colors, complete with all the pieces (sheets, pillow case and sham). Very happy with the quality too. This set is so cute and my daughter loves it. She has a full bed and fitted sheet is a little tight. The only thing I didn't like was that the fitted sheet was too big for the twin mattress.It said Twin/Twin/XL on the package and I didn't see this online. I just bought sheet savers and it helped. This is perfect for our 3 year old's bed; however, it doesn't fit a pillow top mattress, so it's hard to keep the fitted sheet on. The sheets are thin, but I don't expect to use these longer than a year or two, so the price was right. Bought this for my daughter's bed .. Nice color and pattern, exactly as depicted.. but you got what you paid for... the material is cheap.. won't last long..
Granddaughter loves comforter. Good quality. I would recommend this to anyone. Also delivered on time. I am very pleased with the product. I received it in perfect condition. The delivery was super fast. I bought a Sweet Butterfly Bed in a Bag with Sheet Set. Everything was in the bag, not a piece was missing. The colors are just amazing! I would buy again at overstock.com anytime. Thank you! My daughter loved it! It comes with sheets and 2 pillows which are adorable! 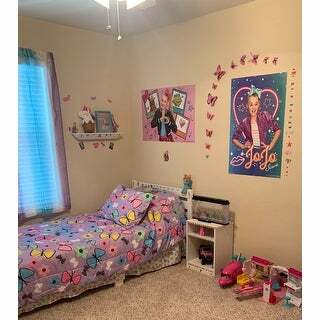 Her room theme is Jojo so this comforter looked great in her room! Highly recommend it !!! This is a great product for my daughters toddler bed and her room has a butterfly theme so the bedding works perfectly. It's very whimsical and cute for a little girls room. Love the bed ensemble I bought for my granddaughter. Love the design of butterflies, flowers and colors. She absolutely loved it. pretty, but sheets are very thin. 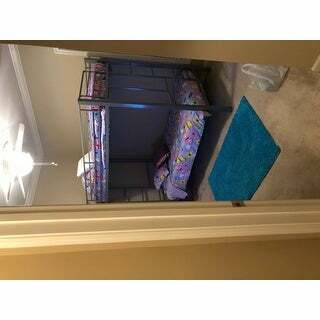 Love it my granddaughter loves her bedroom. Colors that will brighten any little girls room. "Is there a window valance that you could recommend to coordinate with this comforter set?" HelloThbear07, The Bedtime Butterfly Window Valance could be cute or the SWEET JOJO DESIGNS line has a lot of different styles that could be adorable like the turquoise zig zag pattern. Thanks for shopping with us today. "Does the fitted sheet fit a pillowtop mattress?" "What is a full in Ireland, is it a king r double. Thanks"
Hello 5stars79, in Ireland the dimensions are 54 inches × 75 inches (135 cm × 190 cm, which is a full. Please feel free to contact us again with any further questions. Thank you for shopping with us! "what comes in the twin set it says 7 pieces???" Hello brigirl01, thank you for your interest in the Sweet Butterfly 7-piece Bed in a Bag with Sheet Set. The twin consists of fitted sheet, flat sheet, comforter, pillow sham and pillow case. We will get this fixed on the web site as soon as possible. Thank you for shopping with us.